Declawing cats remains a controversial topic because of the views held by opposing parties. Those who argue for it have the view that as humans have domesticated animals, we have done some things to make the lives for both the animal and the human better. As an example, people may argue that zebras live out in the wild and never need shelter and therefore it’s close cousin, the horse, should also be able to withstand harsh temperature and exposure to the elements without having to be confined to stables. Some may argue that stabling a horse deprives them of the natural ability to roam around freely and enjoy not having to be confined. However, we know that providing stabling provides shelter and in turns improves the lives of horses in a harsh climate. More appropriately, some people will argue it is cruel to put a steel bit in a horse’s mouth to let them comply with what we want them to do. And this mostly for our own benefit. So in the domestication of cats, those who argue for declawing will say that it is for the animals’ benefit that they are declawed because the alternative to having expensive furniture ripped up by a cat scratching it, is an animal shelter or even worse – death. They further argue that if the procedure is done with the animal receiving full general anaesthetic in a fully sterile operating theatre, and the surgery is performed by a competent and qualified veterinary surgeon, all should be fine. If one can provide the animal with appropriate painkillers in the post-operative period and prevent them from contracting an infection, and the healing process is closely monitored and managed with an outcome where the animal has no after effects, then it warrants doing the procedure and providing a loving and safe home for the animal. Clearly one can understand that this becomes a very emotive issue because those who argue against declawing will be quick to add that there are many alternatives to removing the cat’s digits and nails altogether. Firstly, they will argue that going to the extent of doing an amputation in an animal, merely for protecting furniture, is a form of mutilation and is going too far. Further to that, they may argue that you are creating an unnatural situation for the animal by taking away one of its primary self-defence mechanisms. Declawing the cat may also leave the cat exposed in a social environment where most cats never stay confined to the human residence only, but tend to venture outside, especially at night, and explore their territory. Many people forget that a cat’s territory is not defined by the boundaries set by humans. So, your high fence around the property, even if it has an electrified security fence on top of it, will in most cases not suffice to confine your cat to your own property. Their territory often extends three houses up the street, two down the street and even to properties across the road from yours. Leaving a cat without nails to defend itself is almost unthinkable, will those say who object to declawing. This territorial movement and exploration of cats is to a large extent dependent on their ability to climb and jump up and down walls and trees. Their nails are a pivotal part of the ability to grab onto something, especially if they must jump very high, almost out of reach. Not even to talk about the risk of being chased by the next door neighbour’s dog and having to get away via the quickest and sometimes least accessible route. One way to reduce territorial movement is to sterilise your cat either by neutering (castrating) your mail cat or by spaying (ovariohysterectomy) your female cat. Roaming and territorial exploration is significantly reduced in sterilised cats. So, what then is the solution to removing the cat’s nails and front digits completely and permanently to save your furniture? Firstly, we should acknowledge that scratching is part of the feline makeup and is a normal behaviour. It is a way for cats to remove the dead and broken parts (husk) of their nails. As with humans, cats’ nails never stop growing. As humans, we trim our nails and take really good care of them by manicures and pedicures. Because our feline friends’ nails also keep on growing, the excess should be removed in some way or other and scratching is the way this happens. A kid, seeing a cat scratching up against a tree or a scratching pole will sometimes make the remark: “Look mom, that cat is sharpening its nails”. Although cats do not consciously decide: “I need to sharpen my nails today”, the effect of scratching and removing dead and breaking pieces, is in fact that the nails stay healthy and naturally sharp. 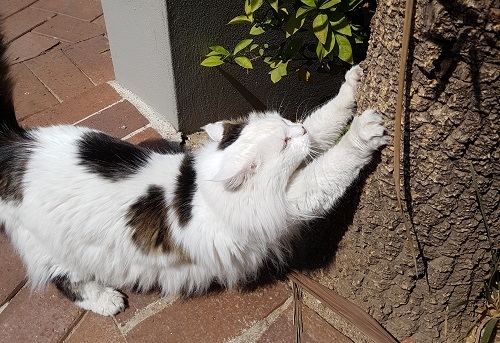 Scratching is also part of stretching and cats are notoriously supple animals and benefit from the anchoring that is provided by “clutching down” onto something and extending their stretch as far as possible. Because scratching is part of cats’ normal behaviour, one should make provision for this necessary part of their health and wellbeing if you decide to keep a cat. It is as much part of feline care as providing food, fresh water, a sandbox, vaccinations, deworming and tick and flea control. If you decide to keep a cat, you must provide a means for them to scratch. This may be in the form of a scratch post, cardboard box scratch pad, a tree stump or log, preferably covered with some hardwearing, short length fibre carpet or hardwearing fabric, or a piece of wood or cardboard with rope tightly wrapped around it. There are all kinds of shapes and sizes and the vet will be able to give you advice on which one you can use if you are not sure. If one provides for this normal habit in cats, it will often resolve the issue of the cat scratching your furniture. However, as luck would have it, sometimes you will provide all the scratch pads and posts needed, and that darn cat will still choose that favourite piece of furniture of yours, as its favourite scratch pad. In this instance, you may have to temporarily wrap something around that piece of furniture to protect is until you have dealt with the unwanted behaviour. Discouraging the cat from picking your favourite or expensive piece of furniture for scratching may entail putting a spray bottle with water near this point, and squirting the cat with the water every time it comes close to this point. This negative experience will hopefully deter them sufficiently. Alternatively, you can take an empty cooldrink can and put a few pebbles or marbles in it and throw it in the cat’s direction every time it gets close to the site you want to keep it away from (obviously missing the cat and not actually aiming for the cat itself). The noise is bound to make that part of the house less pleasant and to be avoided. There are commercial products on the market which one can stick to the furniture which will deter the cat in some cases. Alternatively, there are nails caps which one can put over the cat’s nails which may protect the furniture. Some of these products are not readily available in South Africa and the long-term practicality of it remains debatable. The best thing you can do is to discuss the situation with the vet and come up with a solution which will work for you. You may have to try several things before you find the solution which will work best for you and your cat. Declawing cats is a procedure which has not been “banned” in South Africa and in extreme cases, with the correct considerations taken, (usually a medical condition like a cancer of the nail bed), may still be performed. However, to do this procedure as a quick fix for a cat damaging furniture through scratching is certainly not the first option which should be considered.